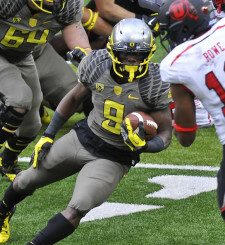 The Oregon Duck‘s star WR and RB, Byron Marshall, is looking to make a name for himself during his senior year. After leading the Ducks in rushing yards as a sophomore and then in receiving as a junior, it is clear to see that Marshall, much like Liam Neeson’s character in Taken, has a very special set of skills. These skills include the blinding speed that is the very personification of the Oregon Ducks along with the versatility to be both a RB and a WR. While Marshall has had a great college career thus far, both as a runner and receiver, many people question where he would fit in the NFL. 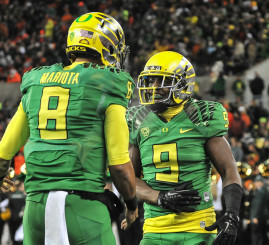 CBS Sports contributor Rob Rang says,“Marshall has a nice stutter-step and burst to avoid defenders and enough speed to break free[…]” but then goes on to say that, “[…]Marshall lacks the size to be a full-time contributor in the NFL.” This evaluation should look familiar to Oregon fans who study the draft as this was also the evaluation of every Oregon back from LaMichael James to De’Anthony Thomas. Given that neither LMJ or Black Mamba have had much success in the NFL as of yet, why should we expect anything different from Marshall? For one reason: he has played extensively as a WR and excelled at the position. While 5-foot-9 and 200-pounds is rather undersized for an NFL RB, it is a perfectly normal size for an NFL receiver in the mold of DeSean Jackson or Percy Harvin. Going into his senior season, the best thing that Marshall can do to prove himself worthy of being an NFL player and breaking the stigma of being an “Oregon system player” is simply continuing to excel as a receiver. While Marshall has all of the ability to be a prominent college RB, he does not have the skills to be anything more than a third down back at the next level. At the same time, he has the necessary skills to be a great WR at both the college and pro level. Don’t think that Marshall mainly playing WR would only benefit him, however, as Oregon already has at least two, possibly three, great runners while being somewhat thin at WR. Byron Marshall playing primarily WR with some plays utilizing him as a runner or receiver out of the backfield would be good for both him and the Ducks. This would give Vernon Adams, Jeff Lockie or whoever winds up being Oregon’s starting QB a great target to throw to while allowing Thomas Tyner and Royce Freeman to get their touches in the run game. In the end, regardless of where he lines up, Byron Marshall will be fantastic as a Duck; the real question is how will he fare going into the draft after next season.